When potting lily bulbs, use one gallon of potting soil per mature bulb in a container with ample drainage holes which is at least 8 to 12 inches deep. Lily bulbs make stem roots between the bulb and the surface of the soil; these are “feeder” roots which absorb nutrients for the bulb and are grown new each season. The basal plate roots on the bulb's bottom act primarily as a counterweight to keep wind from toppling the stem, and are of less importance than the feeder roots. In containers that are only 8 inches deep, place bulbs almost on the bottom of the pot so there will be at least 6 inches of soil covering the lilies. Any less soil on top of the bulb will prevent stem roots from forming properly, which will severely limit the growth potential of your lily bulbs. Provide at least one gallon of potting soil per large bulb, to give lily roots enough room and to encourage bulblets to form on the underground stem. Large fiberglass or molded plastic pots, especially of double-wall construction, are preferred since the larger soil mass acts as insulation during both winter cold and summer heat. Plus, a large pot allows for space to plant trailing annuals which will drape over the sides of the pot and soften the lines. They are much lighter weight and easier to move than similarly-sized clay or pottery, which allow for easy rearrangement of the container during summer. Pre-moisten potting soil before filling your container. Place bulbs - pointed side up, roots down - about 4 to 5 inches apart; any closer and you’ll need to divide the bulbs more frequently than every two to three years. Put a small plastic label underground next to the bulb for future reference, should the top label fade or be lost, and cover your bulbs completely. Lightly pat down the soil to firm it. Water the newly planted lilies, only until you see water streaming out of the drainage holes—and if needed—top off with more soil. Leave about two inches between soil and the top rim of the container. Add a marker label for easy reference and do not water lilies again until the potting soil is dry two inches below the surface. Lily bulbs are designed to store moisture in the fleshy scales that make up the bulb; they do not swim well, so if you allow their soil to stay constantly wet the bulbs will most likely rot. When sprouts emerge, sprinkle one tablespoon of balanced granular fertilizer around the sprouts, but not touching them. Water pots as normal, and add another dose of fertilizer when the flowers are budded and just beginning to open. We like Rose fertilizer or similar formulas, but you can also use a time release mixed into the top two inches of soil. The first number in a fertilizer should always be lower than the other two (e.g. 10-20-20). This simple twice-a-year feeding will keep your lilies in prime shape for up to three years before bulbs need to be divided in autumn or winter. In Midsummer, top-dress soil around stems with compost or aged manure. Lily bulbs grown in containers must be protected from excessive moisture and/or “freeze-thaw” cycles during winter, or bulbs will rot. Successful strategies for over-wintering lilies include moving containers under decking, beneath a roof overhang, into an unheated greenhouse, cold frame, or into a cool garage for winter. Keep in mind that soil in containers should stay slightly damp, but not be soggy. In spring, move lilies into a protected area outdoors when sprouts begin to emerge. In a home garden, do not dig out bare bulbs to store over winter. We use humidity controlled coolers and damp peat moss to store bulbs indoors; gradually dropping air temperature to mimic nature until the peat moss is frozen, thus keeping bulbs in hard dormancy. Lily bulbs are happiest when left in the garden over winter or stored undisturbed in pots to grow larger with more flowers next summer. 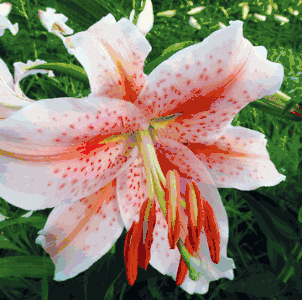 Choosing the lily variety to grow in pots is easy, simply select varieties which are less than 3 or 4 feet tall. Remember that lilies will become taller when planted in shade, so be mindful of the area the pots will be placed.